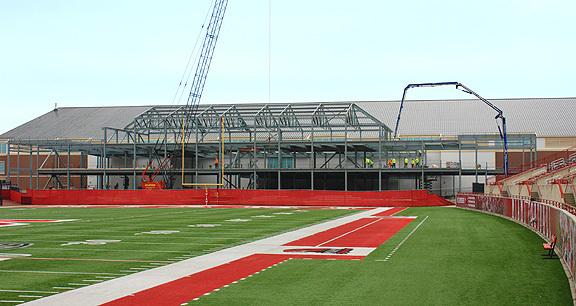 Project obstacles and solutions: In August 2015, Miami University broke ground on the Gunlock Family Athletic Performance Center, located between the north end zone of Yager Stadium football field and the Dauch Indoor Sports Center. The new facility was designed to give year-round support to the football program and includes a dedicated weight room, training and rehab space, a locker room, an auditorium, a players' lounge, coaching staff offices, and space to feature the history of Miami University Football. The Gunlock Family Center will be used by both current student-athletes and recruits. Since the new facility attaches to the Dauch Indoor Sports Center on one side of the complex and overlooks the football end zone on the other side, there was limited space to operate the concrete pump and deliver concrete to the site. For that reason, IMI QC/QA designed a 4,000 psi non-air mix that used a mid-range-water-reducing admixture. The water reducer helped the pump move the concrete to the site with ease and without compromising strength or slump restrictions. IMI supplied a total of 2,500 yards of concrete that was pumped onto the site. For more information on concrete mix designs that can be easily pumped, contact the sales representative for the concrete plant nearest your location. Click here.